The drivetrain is an essential part of a bike. But it becomes more and more complex. Classically, one distinguishes derailleurs and hub gears, but the gear categories now have a greater variety. This can result in confusion and requires that you take the time to familiarize yourself with the subject. Single-speed purists who rely on just one gear on a bike, are allowed a little smile here, but even the ones rejecting multi-gear systems will find some interesting information in the following paragraphs. The derailleurs change the ratio by shifting the chain over sprockets and chain rings. The ratio is changed by shifting the chain via front and rear derailleurs to another sprocket so that it adjusts to the circumstances (uphill, downhill, desired pedal frequency). While approximately 5 years ago, all MTB drivetrains used to be equipped with 3 speed cranks in the front and with 7, 8 or 9 speed cassettes in the rear, the introduction of the 10 speed system with the greater range of the cassettes provided the option to simply go with one chain ring up front and to pass on front mech, front shifter and one or even two additional chain rings. In the end it is a matter of taste which of these versions is the right one for you. 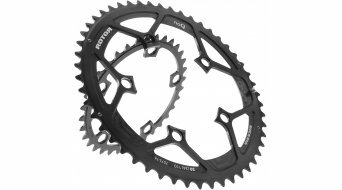 But basically, a single ring system (meaning only one chain ring in the front) is recommended for racers while the all mountain bikers like to use two or three chain rings in the front since they in the end provide the larger range for fast downhill rides or even the steepest uphill rides. But you have to accept more weight in this case. Although a gear system with only one chain ring offers less range, all gears are fully usable, an erroneous use of the wrong gear in the hectic racing operation is practically excluded and it saves about a half kilogram of weight on the bike compared to the gearing system with more chain rings (left side gear lever, front derailleur and shift cable are not needed in this case). The gear hub guides the chain with only one chain ring onto one sprocket. The switching operations themselves take place in the rear wheel hub via a gearbox. There are gear hubs from 3 up to 14 gears available. The bike transmissions were added. They are in the area of the bottom bracket bearings and thus with them, the centre of gravity is more central in the bike. The advantage of all bike transmissions is that the chain line is always the same, which considerably reduces the wear and tear compared to derailleur based systems, but gear hubs are much heavier and often very critical for the centre of gravity of a bike. Therefore, gear hubs and gear boxes are only seldom used in MTB's and road bikes. This is relatively straightforward the power train of chain links which transfers the power of the crank unit in the front to the hub in the rear. Chains are distinguished in accordance with their use for different gear categories and mainly distinguish themself in the chain width. But the quality is definitely also a distinguishing factor. 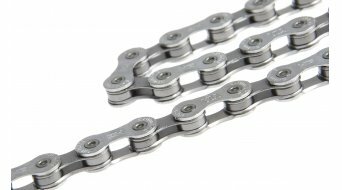 Many riders tend to ride with inexpensive chains (in comparison to the drivetrain) since the chain is the main wear part. But an argument against it would be that a high wear-and-tear at the chain of course also affects the cassette sprockets and chain rings a lot more and they will thusly also wear out much faster. Therefore, the recommendation should be not to try to save money buying this relatively inexpensive part, but to use a proper, fully nickel-plated chain. A sprocket is the gear-wheel which transfers the power of the chain onto the hubs and thus onto the bike. A combination of more sprockets (currently up to 12 sprockets) on one support is called a cassette. Similar to the chain, there are also differences in quality, but the cassette mainly must fit to the switching system. If for example the gear lever makes 10 gears, you can only have a 10 speed cassette. Here, you can choose more narrow gradations for smaller gear-changing manoeuvres and wider gradations for a range as large as possible. The chain ring is the gear wheel which transfers the power from the crank onto the chain. The bashguard is an impact protection which protects the chain ring against touching down when riding over higher obstacles, such as e.g. tree trunks. The size of the chain ring is also crucial for the range of the entire drivetrain. Before you make this decision, you need to know the bolt circle of your crank, since not every chain ring size can be used with every bolt circle. The bolt circle is the diameter of the imaginary circle, which passes through the middle of the chain ring screws. Diameters of 104 mm and 64 mm (MTB 3/2 speed), 110 mm (road bike "Compact") and 130 mm (road bike "Standard") are currently being used. But at present, different bolt circles and direct mount standards are in production for use with only one chain ring. Here, you must closely look at what is going to fit. For most of the single gear systems, there are socalled „Single-Narrow“ chain rings. These adjust with the tooth width to the form of the chain consisting of more narrow links and wider chain plates and thus prevent the dropping off of the chain. But these chain rings are not switchable, the same as all the other single chain rings, since they do not have any shifting ramps. The crank screw must, it is hardly surprising, fit the crank. For some common cranks there are beautiful, colourful or especially light tuning versions available. This is even more true for chain ring screws. Aluminium has largely established itself as the material for those. But you also have to consider the measurements. Most of the chain ring screws work with 8 mm threads, but there are also a few cranks which work with 10 mm. The length is especially important. 5 mm are common for the installation of a single chain ring, the length for the installation of two chain rings or one ring and a bashguard at a fastening point amounts to 7 or 8 mm and for the installation of particularly thick bashguards of polycarbonate there sometimes are also 10 or 13 mm chain ring screws available. This encompasses all materials, which are required for repair or installation of the chain. So these are either rivet pins or chain locks. The rivet pin is still the most secure, long-life version to close a chain and thus is also used by Shimano and Campagnolo. Sram and KMC place emphasis on the practical chain lock since you do not need any tools. The chain lock consists of two interlocking chain plates with the corresponding pins. In particular KMC offers also retrofit versions for chains from Shimano and Campagnolo. By the way, a lock is included in every new chain purchase. When buying the spare part, you have to observe the chain width in any case and often also the chain type.